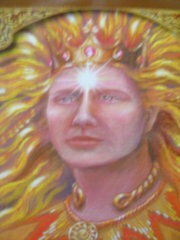 Lugh is the great Celtic God of the Sun, and was greatly skilled at many things. His name translates as "Shining One". As a Divine Jack-of-all-trades, he was patron God to all manner of craftspeople; musicians, magicians, healers, and warriors. In looks he is youthful, fair and handsome. Lugh is a master builder, harper, poet, warrior, sorcerer, metalworker, cupbearer and physician. It's hard to envision anything at which Lugh does not excel. He was venerated throughout the ancient Celtic world. There are at least 14 European cities that are named for Lugh including Laon, Leyden, Loudon and Lyon. Lyon's old name was Lugdunum which means Lugh's Fort. It is believed that Lyon was the center of His worship. Carlisle in England was once called Lugubalium in Lugh's honor. It is believed that many European churches dedicated to Michael the Archangel were built over sites once dedicated to Lugh. Irish and Welsh myths describe the first time Lugh appeared in their pantheon. He was greeted with resistance from the Irish and Welsh women because he joined forces with his father's people against his mother's people. This myth may indicate the beginnings of patriarchy in Ireland. Lugh is the Celtic version of the dying and reborn God and his festival day is Lughnasadh on August 1. As Lugh is the "Sun King" his earthly mother Tailte is the "Great Mother". Tailte gave her people the gift of cultivation, she cleared the land and taught her people how to sow and reap the crops. It was such a tremendous effort that Tailte weakened and began to wither and die. Before she succumbed she told her people that her son Lugh the Sun King would pour his spirit into the grain which would sustain them over the long winter. She asked that they honor Lugh's sacrifice at the harvest of the grains. Lugh greatly mourned the death of his mother and asked that the people honor her and their own crops with a day of merriment and thanksgiving for the bounty of the harvest. At Lughnasadh Lugh is honored for his give of life poured into the grains. Another story of Lugh is his marriage to Blodeuwydd. Because of Lugh's Divinity he was prevented from marrying a mortal maiden so his uncle Gwydion, the God of Sorcery used His magick to create a bride for Lugh from nine kinds of flowers. This was Blodeuwydd whose name means Appearance of Flowers. Lugh and Blodeuwydd lived happily and the world was in perpetual summer, but after a time Blodeuwydd fell in love with Hafgan and together they decided to kill Lugh. Lugh was impervious to any injury either upon land or in water, either indoors or out-of-doors, either mounted or on foot, either clothed or naked. And so it was necessary for Blodeuwydd and Hafgan to go to some lengths to bring about the God’s death. Blodeuwydd prepared a bath for Lugh under an outdoor pavilion. When time came for Him to get out of the bath, Lugh found the tub was too high to easily step out. So He wrapped himself in a towel, and had a nearby goat brought over to use as a stepping stool. As Lugh stepped out of the bath and was balanced with one foot on the goat, the other on the rim of the tub, wearing only a towel under an open pavilion, Hafgan struck during the few moments that the God was vulnerable, running Him through with a spear. Thereafter the world fell to Winter. Grief stricken Gwydion searched for Lugh for many months. At last Gwydion found Lugh, reincarnated as an eagle, perched in a tree. Gwydion used magic to restore Lugh to His former self, and the world returned to Spring, thus inaugurating the cycle of the seasons. Appearance: Usually youthful and handsome in appearance with fair hair and skin. He has a silver tongue to match his skillful hands. Consorts: Many and varied but frequently linked to Rosmerta. Allies: Lugh shared the city of Lyon with Kybele and Paris with Isis. In battle Lugh used his own weapons and those belonging to Manannan. Festival: August 1, Lughnasa (Lammas) which means the marriage of Lugh. In his aspect of the Sun, Lugh renews his vows to the Earth Mother during the August Full Moon. Lughnasa celebrates the consummation of their sacred relationship. Long ago Lughnasa was a four week festival beginning on the last two weeks of July and ending in mid August roughly corresponding to when the Sun is in Leo. Light a Candle in my Shrine. Pray to the God, who is Divine. Ask for Blessings or a Boon. All will come by the light of the Moon.